A theme of the Foundations of Evaluating Public Transit Networks series has been iteratively producing better measurements by understanding the limitations of the current ones. Previously in the series, I concluded by stating that Point Utility, or any measurement that is focused at a single point, only partially describes how useful a transit network is. In this post, I will refine the measurement of Point Utility further by focusing on a single key problem. In its current form, Point Utility measures how often riders can reach destinations from a single origin point. Rarely, however, do riders want to go on a trip and never return. Therefore, even if a transit agency is only looking to measure how useful transit is at a given location, Point Utility will not do the job in its present form. Fortunately, the Score Generator has a solution to this problem. Rather than answering the question of what destinations a rider can reach from a single starting point, it can treat the given point as a destination rather than an origin. From a technical perspective, the virtual rider starts their trip at the end time, calculates the time and distance of walking trips with each reachable point as the origin rather than the destination, looks at where buses have been rather than where they are going, and moves backward through time. Thus, the question becomes "from which locations can a rider start to reach the destination point within a time duration?". The need to answer this question is most evident when a Qualified Point Utility map is desired. The example maps below compare the original Qualified Point Utility map (interactive version) from the Foundations of Evaluating Public Transit Networks, Part 1 post with a map at the same time and with the same duration, but showing origin points that can reach the Public Transit Analytics office (interactive version). At a single time of day, transit service can be very asymmetric. Certain buses designed to get commuters into work may run only in a single direction at specific times of day. There is also the matter of timing. When looking at a single time, the distance one can go and the transfers one can make depend critically on the precise times at which buses are scheduled to be at stops. It is logical to assume that when considering a Point Utility map, the all-day nature of the map will make the directional variation disappear. This is not entirely true, however. Somewhat different Point Utility scores are observed in the maps below: the Point Utility map from Foundations of Evaluating Public Transit Networks, Part 3* (interactive version) and a map showing the all-day reachability frequency of the Public Transit Analytics office from many destinations (interactive version). Though the results are considerably less asymmetric, the two-point difference in Point Utility observed in the example is non-trivial. Several factors can explain this. One is as simple as geography: when walking, it is faster to walk downhill than uphill, so direction matters for locations in hills or valleys. The nature of transit routes can also introduce variations. Some buses, even ones that run in both directions all day, have directional variations in their routings, particularly near the ends of routes. Buses may make stops in a loop as they turn around. This can make for an easy transfer to another route in one direction, but a more difficult one in the other. While these differences do not seem as though they would have considerable impact, the differing Point Utility scores strongly indicate that transit agencies must consider both directions when doing analyses. As a matter of terminology, when a Point Utility score refers to a point's reachable destinations it is referred to as Outbound Point Utility (oPU); when the score refers to the origins that can reach a point, it is called Inbound Point Utility (iPU). When the Point Utility is not prefaced or otherwise disambiguated, it refers to Outbound Point Utility by convention. Because Inbound Point Utilities are computed and visualized almost identically to Outbound Point Utilities, it's possible to contrast two Inbound Point Utilities. The Outbound Point Utility example in the previous post* (interactive version) and the analogous Inbound Point Utility version (interactive version) are shown below. The considerable difference seen in all the maps should underscore that relying solely on measurements that look at reachable destinations from a single point does not capture the full story of how useful the network is. Unfortunately, many of the transit planning tools that I have run across share this limitation. Considering the origin points from which a destination can be reached sheds light on a little bit more of the rider experience. In the coming weeks, I will explore Score Generator features that add to this illumination. Is your transit agency limited to one-way analyses? Contact matt@publictransitanalytics.com to understand the full rider experience. *These maps are actually regenerations of the original maps due to a Score Generator error that incorrectly placed some destinations beyond the bounds of the map in Sectors on the map. In the original maps, these manifest as reachable Sectors near Hunts Point that are in the water. This week, I am taking a break from the Foundations of Evaluating Public Transit Networks series to explore a variation of Point Utility maps that should be of great assistance to both transit agencies and their customers. In last week's post, I proposed a hypothetical conversation between a transit planner and a rider. 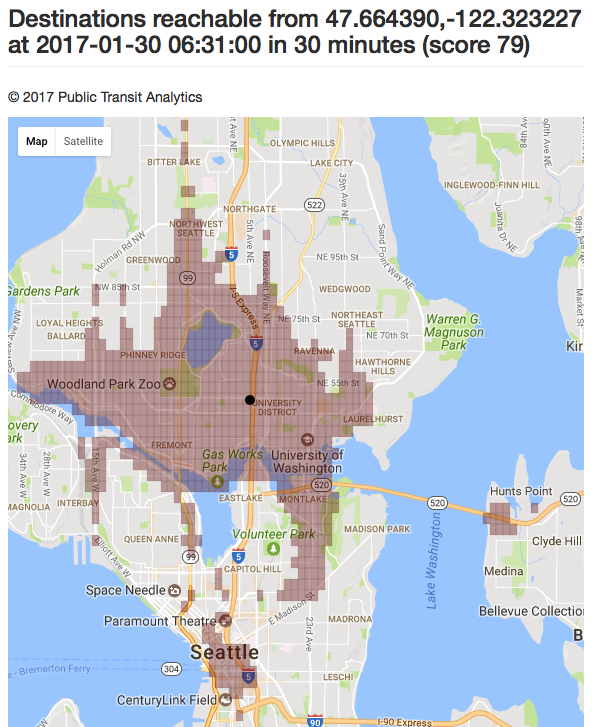 In that scenario, the transit planner can show a concerned rider the quality of transit service in their area by showing them a Point Utility map. Riders, however, are most often likely to become concerned when their network is undergoing change. Thus, a tool that can measure and illustrate change is a powerful one in a transit agency's arsenal. Point Utility scores are designed to be comparative. It is possible for a transit planner to respond to a rider's concerns about a restructure or service cut by showing them Point Utility scores, centered at the rider's home or office, from before and after some network change. This, however, would likely fail to result in constructive dialog. A set of scores that demonstrates a massive improvement in the rider's transit situation may be sufficient on its own, but may still be too abstract to be compelling. In situations where the Point Utility score stays the same or declines, the score provides no diagnostic information to understand this decline. When compressing this much data into a score, some of the nuance is lost. Of course, it is possible to present two Point Utility maps side by side, providing a depiction of the transit network before and after the change. This, however, becomes difficult to process visually. Keeping track of a single Sector when switching between maps can be challenging and colors can appear to be different based on the colors around them when they are in fact the same. 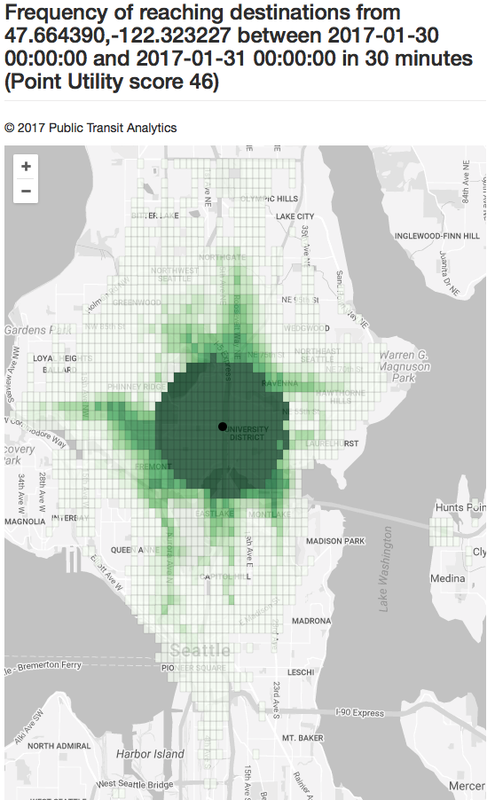 For that reason, the Public Transit Analytics Score Generator can overlay one map on the other, yielding maps like the one below and its interactive version. 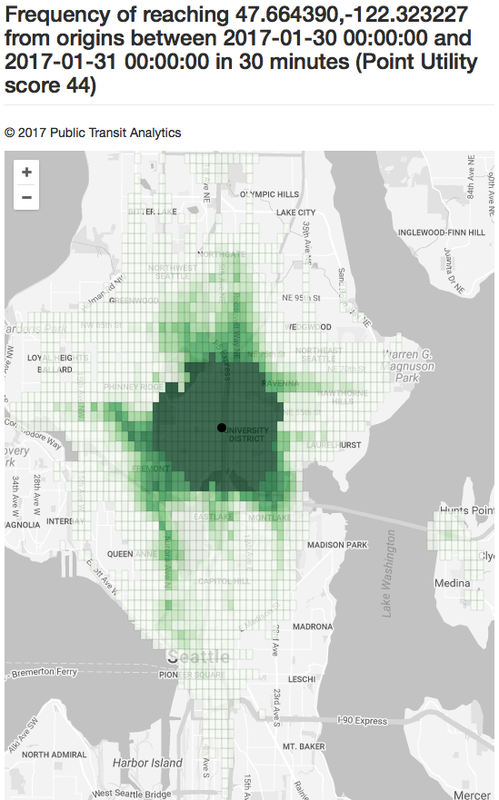 Specifically, this maps looks at the difference in 30 minute Point Utility at the Public Transit Analytics office using the previous example of January 30, 2017 as a trial, compared to a baseline of a Monday around the same time in 2016. In a Point Utility map, the frequency at which a Sector can be reached are divided into nine intervals, or bins. The comparative Point Utility map shows the difference between the two bin values at each Sector. Sectors more strongly orange can be accessed a greater number of times within the trial time span. Sectors more strongly colored blue can be accessed less frequently. Grey Sectors are ones where the bin value does not change. To get precise information on how much of a change occurred, hover the cursor over a Sector. Clicking on a Sector reveals the most common, or mode, path that serves as the fastest way to reach the sector for each of the baseline and trial times. Just these pieces of information can be useful in diagnosing potential issues with a restructure, before or after it is implemented. In this example, it is somewhat surprising that there is not a significant change in Point Utility between 2016 and 2017. 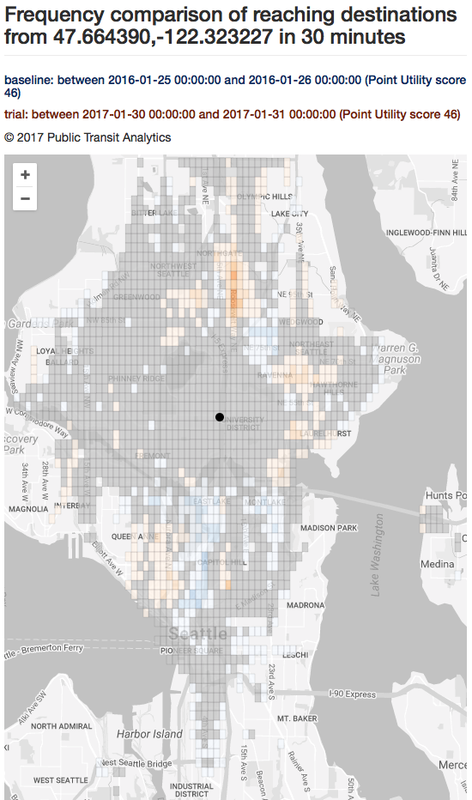 In that time, Puget Sound's Link Light Rail line had been extended, representing a large influx of frequent service in Seattle's Capitol Hill neighborhood and the eastern edge of the University of Washington. 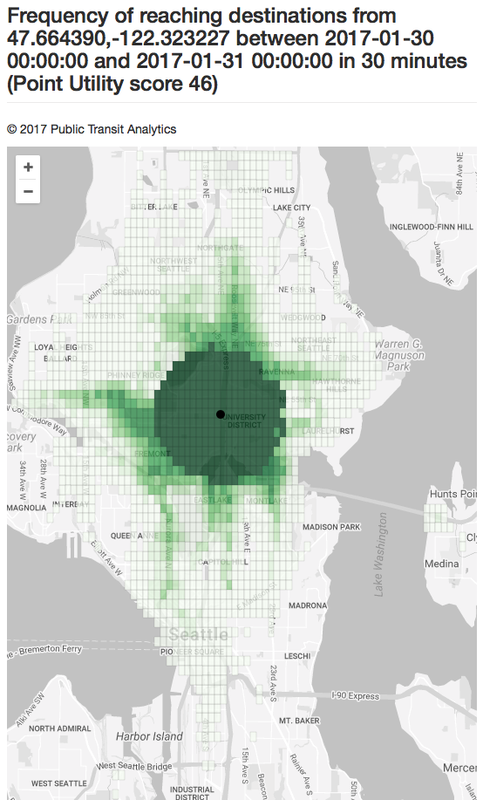 This freed up bus capacity to increase route frequency in north Seattle and prompted a substantial restructure of the bus lines serving the area to take advantage of the Link's fast connections. 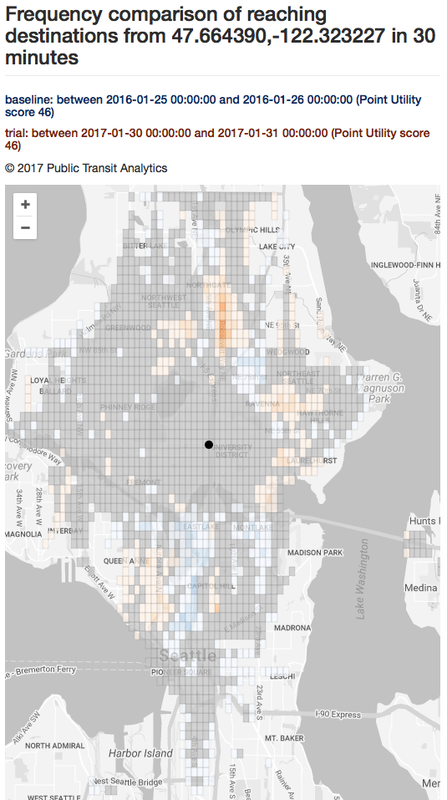 For the eastern edge of Wallingford, where Public Transit Analytics is located, the map shows that the results have been mixed. Looking at the most common paths offers a first stab at explaining the degradation indicated by blue regions. An area of blue between Ravenna and Maple Leaf provides an interesting example (outlined in black below), as many new hours of service were invested in this area. Despite making considerable frequency improvements to the 372 bus, which runs on 25th Street in this vicinity, that bus does not provide a very direct transfer opportunity with the frequent east-west service near the Public Transit Analytics office, the 44 bus. Notably, this path is not the mode path for the trial; instead a path featuring a bus that only runs at commute times (not pictured below) is the most common one. In the past, the area was served largely by the all-day, though infrequent, 72 bus, which offered transfer opportunities more suited for east Wallingford. With its ability to highlight problematic areas, and hint at their causes, the map can indicate when reconsideration of certain parts of the restructure may be warranted. While comparative Point Utility maps are still limited to showing how useful a transit system is at a single point, they represent perhaps the strongest tool available for having a constructive dialog when making changes to a transit network. As long as an agency's schedules reflect reality, Point Utility maps capture what a rider can actually do more accurately than the maps generated by any other tool that I have seen made available to transit planners. The increase in accuracy comes along with a comparative viewing mechanism unparalleled in other tools. Contact matt@publictransitanalytics.com to discuss using comparative Point Utility maps in your transit agency's future projects. 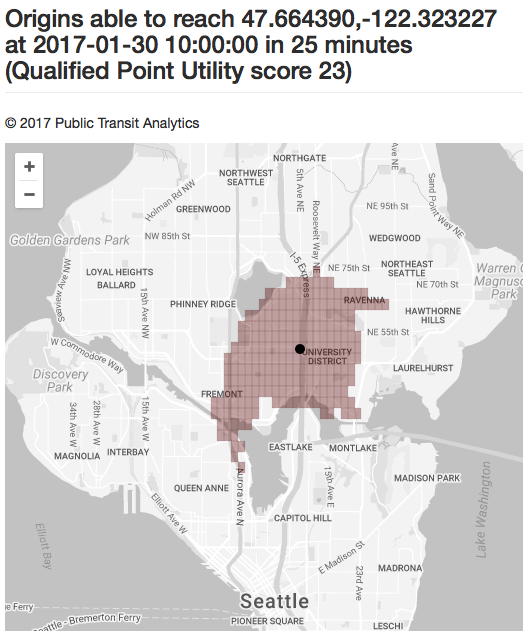 In the previous post in the Foundations of Evaluating Public Transit Networks series, I ended with a brief discussion of why Qualified Point Utility on its own does not represent how useful a transit network is to its riders. One reason comes from the "Qualified" nature of the measurement. A Qualified Point Utility score does measure something, but only at a precise moment in time. Looking at a transit network at a specific time of day does not provide an accurate view of the overall utility of the network. In some ways, this is an intuitive conclusion. People can use public transit networks at any time of day. Suppose, however, an agency chooses to limit its analysis to some majority of riders that uses transportation in a predictable, scheduled fashion. An agency dominated by day-shift commuters may limit its analysis to typical commute times. In this case, the range of starting times might be small enough for the agency to feel comfortable selecting a single starting time. The implied contention is that this single time is largely representative of the whole time range. 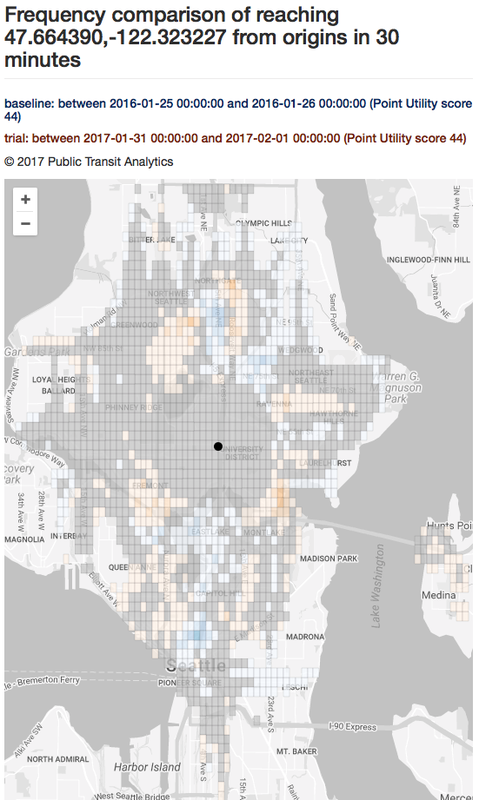 This is observed in practice outside of Qualified Point Utility computations: King County Metro's comparative isochrone maps, examined in the previous post, have a starting time of 8:15. To determine whether a single time can be representative, or put more technically, if a Qualified Point Utility at a single time is representative of the network's utility in a time span, I ran a brief experiment. 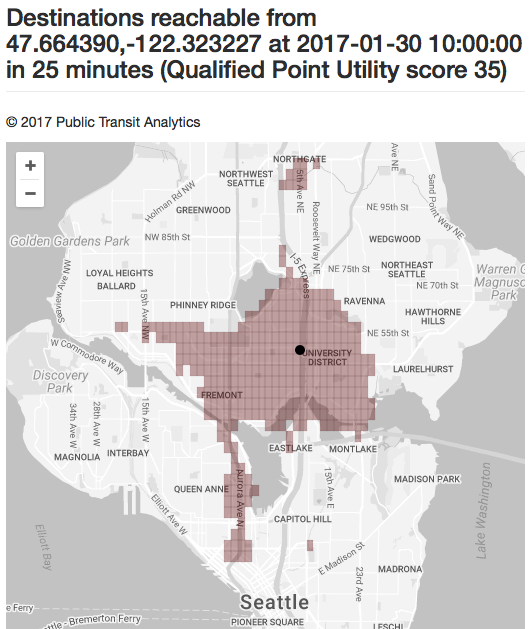 I started by having the Score Generator generate the 30-minute Point Utility from the Public Transit Analytics office at 6:31 ( ). This yielded a score of 79 and is visualized below, with an interactive version available as well. To determine how representative this score was for an individual who generally rides transit in the early morning, I then had the Score Generator run the same request, but for each of the subsequent five minutes after 6:31. The results are striking, particularly when visualized, as seen below and in the interactive version. The range of scores, from a low of 49 at 6:34 to a high of 79 at 6:31, represents considerable variation in how useful the transit network is. As the map is a 100 by 100 sector grid, a score that is 30 points higher than another represents approximately 300 more sectors of the map that can be reached within the 30 minute time constraint. Furthermore, even when two consecutive times have the same score, as with 6:34 and 6:35, the area of the map that is reachable is considerably different. 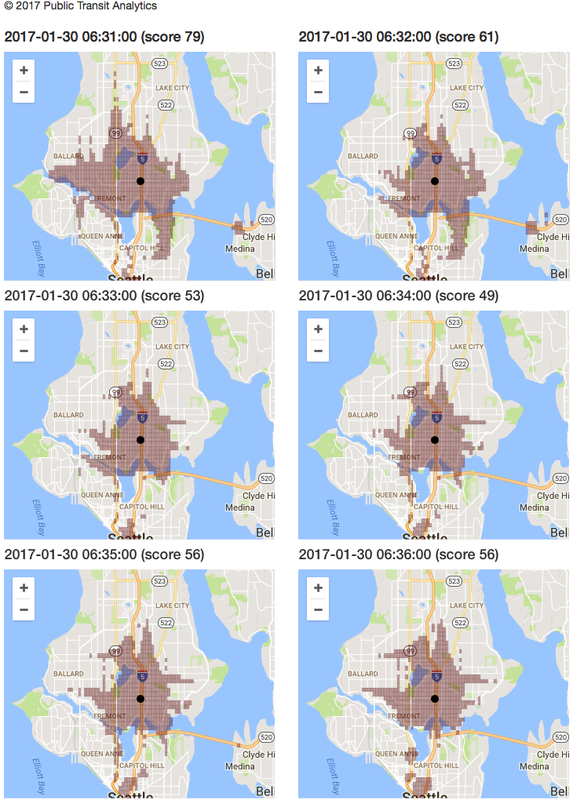 The results of this experiment cast doubt on any method of evaluating a transit network that is limited to a single time, even if the transit agency believes that time to represent the common experience. Transit networks are complex and volatile; the interleaving of the schedules of many transit lines yields peaks and valleys in the number of destinations that can be reached on a minute-by-minute basis. While this assertion might appear to be a condemnation of Qualified Point Utility, it instead reveals the path going from Qualified Point Utility to a better measurement. In next week's post, I will detail how the Score Generator can do additional work to remove the time qualifier from Qualified Point Utility. Is your transit agency evaluated in a way that fully accounts for its complexity and volatility? Contact matt@publictransitanalytics.com to arrange a consultation.